Every student you teach is a unique individual. However, veterans who are returning home from combat or other deployment are unique from the rest of society. There are many things that we as civilians cannot understand about veterans due to their different experiences. When vets return from combat, fitting in and interacting in a nonmilitary society can present a very real challenge. 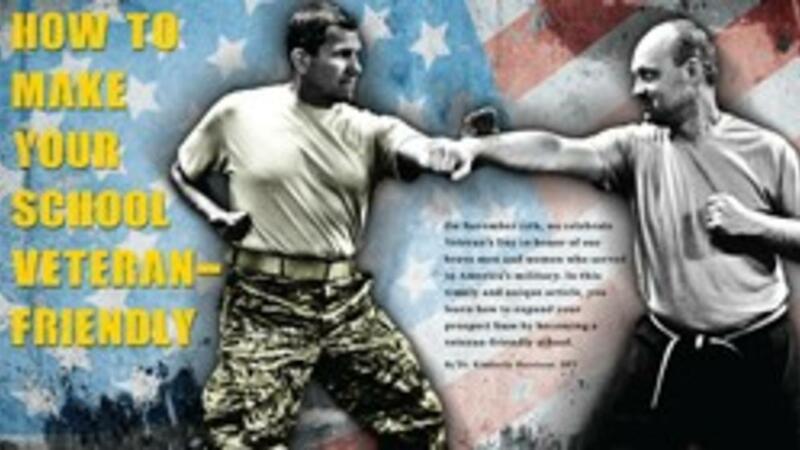 Martial arts is structured in a way that is familiar to veterans, making it a good starting point from which they can work back into the civilian world. As martial arts school owners, we can show respect to the brave men and women who have served by turning our schools into veteran-friendly environments. Being a veteran-friendly school means more than just offering a discount, although this can be a good tool to help them recognize your school as a welcoming oasis. Your primary focus should be identifying common problems veterans have, and finding ways your school can help counter them. One of the hardest things for veterans when they return home is reconnecting with their families. They have been strangers for their entire deployment, and now they have to re-form bonds and jump back into a busy household. You can hold classes exclusively for veterans and their children. This will give them an opportunity to reconnect through teamwork and shared learning, and will set you apart from your competition. The military places a large emphasis on rank and recognition. Similarly, martial arts uses colored belts to distinguish students. You can take an extra step to recognize your veterans: give them a special patch for their uniform, let them wear a camo belt instead of your standard belt, or let them wear a patch from their branch of the military. There are also ways you can arrange your school’s layout that will make it more veteran-friendly. The simplest thing you can do is ensure that the American flag is displayed alongside your school’s flag and the flag of your art’s home country. Veterans are used to being on guard at all times. They may not be able to focus well if there is an entrance or exit located behind them. Veterans will also prefer to keep everyone else in their sight. You can’t change where your doors are located or how your students move while training. Instead, you should make sure there are large mirrors at the front of your class, so veterans have a clean view of the room. Post-Traumatic Stress Disorder (PTSD) is the most common injury affecting vets returning from combat. PTSD can affect anyone who is involved in a traumatic event, and can manifest in different ways. Symptoms can include outbursts of anger, anxiety, hypervigilance and social isolation. Before you can help veterans succeed in your school, you’ll need to find out if any of them suffer from PTSD and what their triggers are. Some triggers you may be able to avoid; however, others are nearly impossible to eliminate. As you can see, many of the things veterans may try to avoid are commonplace in a martial arts school. They may show up for a trial lesson, experience one or more of these triggers, and decide not to come back. While we can’t eliminate all triggers from an environment, we can help decrease the anxiety level of veterans by letting them know what they will experience ahead of time. You may be able to mitigate certain triggers, or eliminate others entirely. As mentioned, your martial arts school can also serve an important role in rebuilding family relationships between veterans and their children. If you don’t have a program where parents can train with their children, focusing on veterans may be the best place to start one. These parent-child veteran programs should focus on teamwork and cooperation between veterans and their kids. Have them work together and learn how to help each other. When they advance to a new belt rank, have them tie the belts on each other instead of you tying it on them. Done correctly, a martial arts program can be a wonderful means through which veterans can reconnect with their families, and become more comfortable reintegrating into civilian life.